If you have a black iPhone 4S that is starting look scuffed or damaged, we offer a complete iPhone 4S refurbishment service. We will replace your iPhone's 4S screen completely (LCD and touch screen), install a brand new battery, new home button, a new black glass rear case, transfer all your other parts to a new metal centre frame and finally install a new SIM card tray. Once complete our iPhone refurbish service restores your iPhone 4S back to its former glory as if it was brand new. 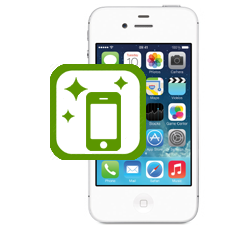 This iPhone refurbish service can be used to convert a white iPhone 4S to a black iPhone 4S.